For small businesses, being discoverable online is critical for finding customers. So, you’re probably one of many in your industry seeking a place in the top ten listing in Google. But with a high number of competitors all targeting the same keywords, it’s getting increasingly difficult to rank well. And even if your website is ranked in the top ten, you’re potentially missing out on a lot of business if you’re not at the very top of the batch. As you can see in this data set from Ignite Digital Marketing, the click-through rate (CTR) drops significantly after the top spots. If you’re not in the top three, you're potentially losing over 90% of your potential leads! You may be thinking, to get my business there is going to be nothing short of an odyssey! There are a lot of SEO (search engine optimization) strategies you can implement to increase the visibility of your website (we suggest treating it like your favorite pet). One that is becoming increasingly important is social media. Does Social Media Really Help? What role social media has in improving your website’s rank in search engines is a question online marketers frequently debate. Google itself has publicly shifted its official stance, first saying that data from social sites does affect page rank, while later saying the opposite. Some of the more recent research, such as this study from content management firm Hootsuite, suggests that it does play a measurable role. •Social media posts that link back to your website improve your website’s “authority.” The thought is that the more people share a link, the more reputable it is and will therefore rank higher in search engines. It follows that if reputable social media profiles happen to share a link, that will also improve its page rank. This is the point that is debated among online marketers. •Social media platforms provide a different way for potential leads to find your business. Some people may find you through a search on a social platform rather than in a traditional search engine. What’s more, social media profiles themselves can also appear directly in a search engine result, increasing your chances of being discovered. •Social media helps build relationships and expand your customer base. When you’re interacting with your customers on social media, it gives them an opportunity to strengthen their relationship with you as well as share what your business has to offer to their own networks. Word of mouth remains one of the most effective types of advertising. So you have business profiles on Facebook, Twitter and LinkedIn—great! In order to get the most out of those platforms so you can grow your business’ authority and visibility online, we suggest following a few dos and don’ts. Do: Make sure your business profiles are complete and have attractive cover images. Don’t: Promote through a profile that is incomplete or amateurish. Do: Develop a unique content strategy for each platform you use—and pick your platforms wisely based on where your ideal audience is spending time. What works on Facebook may not get the results you want on Twitter and vice versa. Create a plan outlining goals, budgets, and KPIs. Here are some KPIs you can’t ignore. Don’t: Post random, inconsistent, irrelevant content, or spread yourself too thin over too many platforms. You’ll be wasting your time and coming across as inexpert. Do: Share valuable, consistent content from your website and other relevant resources that your target audience will love. Don’t: Be spammy with self-promotion and sales pitches. People won’t engage with your posts, and you’ll reach fewer and fewer customers. Do: Be conversational with engaging text, video and images. Interact with your audience regularly and be responsive to their content and questions. Engagement is key on social media! Don’t: Ignore comments or delete negative feedback. Instead, respond to the feedback and show your followers that you are listening to their concerns. Do: Use a scheduler to put content in front of your followers regularly. Don’t: Exclusively rely on automation for posting content. Your followers need to see that they are interacting with a real, live person. Do: Time your posts wisely. As the busy owner of an SMB, you may find you have more time to post to social media on weekends, but for business-to-business posts, weekdays are far better. There has been plenty of analysis of social media, and it has found that on Facebook, weekdays from noon through midafternoon are the highest engagement times, especially during the last half of the workweek. For Instagram, posting in the wee hours of the morning is said to work best, with recommendations of anywhere from 2 a.m. to 5 a.m. Lunchtime comes in a close second, and the tail end of the workday isn’t bad either. Again, posting on Wednesday through Friday is a good bet. On Twitter, midnight and lunchtime posting is best and end-of-the-workday posts are effective too, both in the latter half of the workweek. Another way you can use social media to boost your website’s visibility is by having a blog. Why do we suggest using a blog on your website instead of another resource? After all, it is possible to post your business’ updates exclusively on social media instead, or simply link to helpful information on other websites. Think about it: You share someone else’s article, and the users go to their website. If they read the article but that website is not related to you at all, it may bring more benefits to the owner of that domain, but not to you. But if they came to read “New Helpful Content” from your company website, they are more likely to engage with your business and share that very helpful information with their own friends and colleagues. And while the jury is still out on exactly how social media links boost SEO, the more traffic you get to your website, the more likely people are to share it and increase your visibility. And Google notices these things. Give it a try! Post your own articles and redirect users directly to your website. Humanizes your brand: Blogging gives your business a way to touch on issues and concerns of interest to your prospects. Builds authority in your industry: A blog is one of the best ways to establish yourself or your brand as an expert in your field. Facilitates valuable discussion: Blogging gives businesses the opportunity to connect with customers and prospects through a two-way conversation. It signals to visitors that you’re open to comments, feedback, and even criticisms. That´s a sign of a trustworthy company. At DocuSend, we're proud to build ongoing relationships with you, our followers and customers, via our various social media channels and this blog. Equipping your business for success is our business, both by providing you with your own mailroom in the cloud via our state-of-the-art document printing and mailing solution and by sharing with you what we know about making SMBs grow. We're still learning, so let’s learn together. 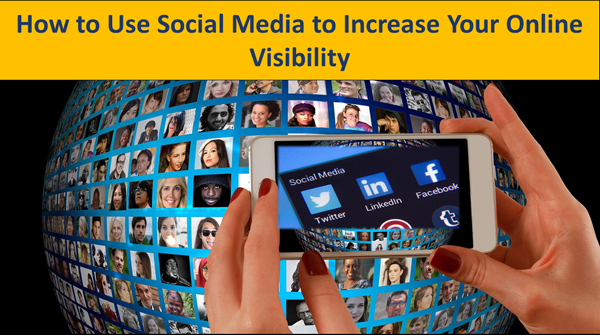 How are you using social media to increase your business’ online visibility? Leave a comment and let us know what’s working for you.